In 1869, traffic in Manhattan was a nightmare. It's not so great today, but it could be a lot worse. Broadway, the main north/south artery, was regularly clogged with horse carts, pedestrians and omnibuses, slowly making their way up and down the island. The avenues of New York, which also run north to south, weren't much better. There had to be a better way. A train would make sense, except that the city was so crowded, there was nowhere to lay the tracks. An underground train would be great, but the only engines available at the time were steam engines, which give off a lot of smoke. An underground train would be impossible to adequately ventilate. An inventor from Springfield, Massachusetts named Alfred Ely Beach thought he had a solution. He conceived what he called the Beach Pneumatic Transit, which he proposed would be New York's first subway system. He imagined a series of underground cars that would be rushed along not by steam locomotion but by compressed air: a pneumatic transit system. Underground pneumatic systems already existed in Europe, having been introduced in England in 1836, and by the time Beach came up with his transit plan, pneumatic systems were in cities all over continental Europe. However, Europeans were using their pneumatic systems to transport mail. Beach wanted to transport people. Beach originally demonstrated his pneumatic rail car in 1867 with a working model. Next he wanted to build an underground system of pneumatic rail cars to move people around Manhattan. Beach had some difficulty drawing support for the project, since it was opposed by State Senator William Marcy "Boss" Tweed, the notoriously corrupt political boss. In order to win over Tweed, Beach proposed that he simply build a pneumatic mail system under the city, which Tweed permitted. Later on, Tweed allowed Beach to build a single large tunnel for his rail system. This was good news for Beach because it gave him a chance to demonstrate the viability of his invention, which he'd invested $350,000 of his own money in. A drawing of what the Beach Pneumatic Transit system. It's not far off from the final design. The original tunnel ran along Broadway, covering 312 feet (one city block) between its two stops at Warren Street and Murray Street. Construction started in 1869, and the Beach Pneumatic Transit was open and taking riders on February 26, 1870. There was only one track with one car on it, which could hold 22 people. The tunnel was 8 feet in diameter. Despite the tepid support the pneumatic transit had from the public, there was great interest in it when it opened. Within the first two weeks of operation, the Beach Pneumatic Transit had seen 11,000 riders, each paying 25¢ a ride. Instead of recouping some of his investment, Beach invested instead in publicity, giving all profits to the Union Home for Soldiers' and Sailors' Orphans. Beach saw this as only the beginning. The line, when completed, would run under Broadway from Murray Street to Central Park, a total of five miles, with many more stops. Now that Boss Tweed had come around to Beach's vision, he should have no trouble securing the permits in the future. Further, the pneumatic transit was a popular attraction, which was good publicity. However, by 1871, Boss Tweed's reputation started to fall. With the pneumatic transit's reputation attached to Tweed's, Beach had something to worry about. Showing that he understood a thing or two about politics himself, Beach started to publicly claim that Tweed had opposed the pneumatic transit project all along. Boss Tweed, New York's most notorious political boss ever. This might have helped the Beach Pneumatic Transit's reputation some, but it wasn't enough to survive what was coming. The Panic of 1873 saw banks fail the economy go into a tailspin, which ultimately did in the pneumatic transit. That same year, the Beach Pneumatic Transit was shut down and the tunnel sealed off with the car still in it. Years later, the five counties of the state of New York that would become the five boroughs of New York City agreed that within twenty years of their unifying as a city, all five boroughs would be linked by an underground subway system. 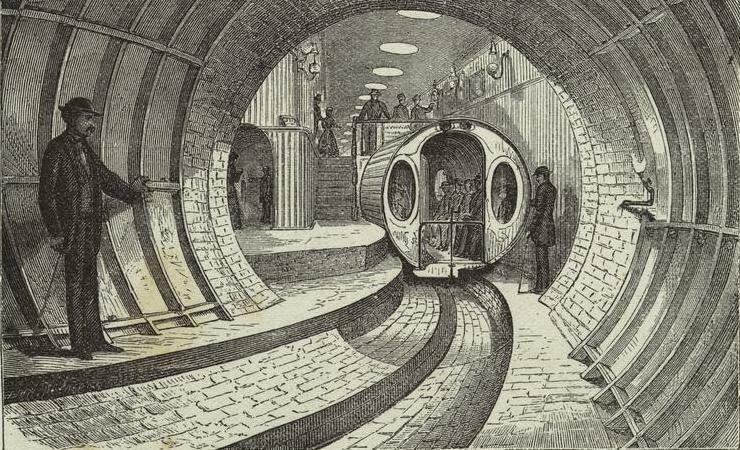 The subway that was eventually constructed was to be electric, not pneumatic. In 1897, a year after Beach's death from pneumonia and a year before New York City as we know it today was formed, workers building the new subway system dug into Beach's old tunnel. The tunnel was widened to meet the needs of the subway. If you ride New York's N, R or W train past City Hall, you will follow the path of Beach's secret subway. The pneumatic mail system eventually did get built, too. Hundreds of miles of tubes would start moving mail rapidly around the city starting in 1897. When this system was finished, mail could move from the central post office in lower Manhattan to the system's northernmost reaches, Harlem, in twenty minutes. Mail by pneumatic tube in New York continued until 1953, when the city decided that due to the increasing volume of mail, it was time to dismantle it. 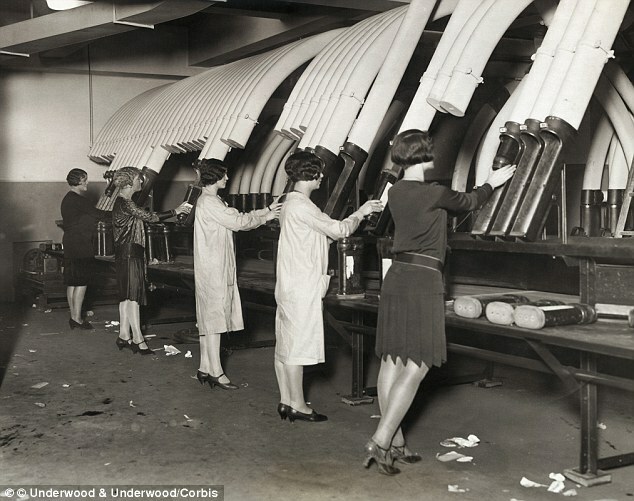 The days of faster snail mail: New York's pneumatic tubes.